It’s a pretty standard looking machine, but Chip did a few special tweaks to make his ISDE week easier. 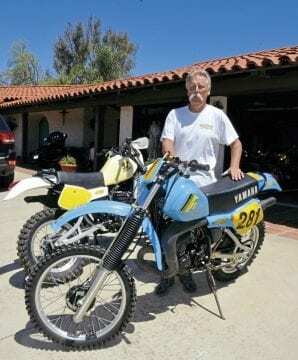 In 1980, Chip Howell, a San Diego-area motocrosser decided on a new goal, representing the USA in the ISDT. “I was working for Husqvarna and tried to qualify with a brand new 390OR and couldn’t get it to finish a race, it was breaking gearboxes. “Fellow racer Larry Roeseler went ‘Yamaha’ and suggested I try a 465 as they were really good.